Cook gnocchi as directed on packages; drain. 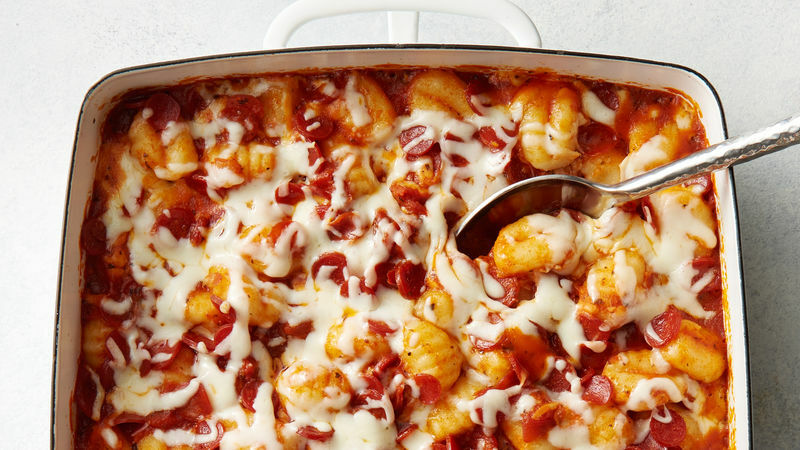 Add gnocchi, half of the pepperoni slices, the pasta sauce and 1 cup of the cheese to baking dish. Stir to combine, and distribute evenly in baking dish. Scatter remaining half of pepperoni slices over top. Cover with foil; bake 15 minutes. Uncover; sprinkle remaining 1 cup cheese over top. Bake 5 to 8 minutes or until cheese is melted and casserole is bubbly around edges and heated through. Any Muir Glen™ pasta sauce will work in this recipe. Potato gnocchi is a shelf-stable product typically found in the pasta aisle of the grocery store.